I love it when great minds think alike. I bought some beautiful strawberries at the store the other day planning to make something sweet for my family. I had decided on Strawberries, Chocolate and Whipped cream, because you can never go wrong with that combo. When I logged on and saw Curry and Comfort's post for strawberry parfaits, I just smiled. Good thing our recipe isn't the same. But still, great minds to think alike. Mine is not the same recipe, but you get the idea. If you have not ever checked out her blog, please do so. She is amazing, one of my top favorite blogs to read. Ok so no cake here. This is a simple recipe to throw together. Makes a very decadent dessert with just a few steps. Now... if you have not mastered making whipped cream, it is easy and takes 5 minutes. I posted the recipe here. If you are really in a time crunch you can buy it. I prefer fresh and homemade. Melt your chocolate by adding 1 tsp Vanilla extract, 1/4 cup heavy whipping cream and chocolate to either a double broiler -or- put it in a microwave safe bowl and microwave it at 50% power for 3 minutes. Stir until smooth. Layer your jar. Strawberries, chocolate, whipped cream... repeat until full. This goes so well with a nice red wine. Mmm! Definitely a winner here! 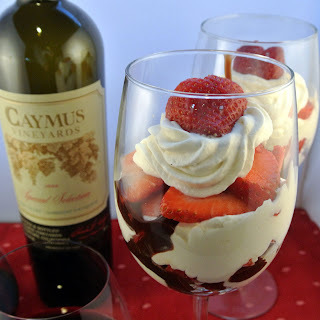 This looks scrumptious and perfect for winding down :-) You're right--Ramona does have great things on her website, too! I love anything with chocolate and strawberries! Yum! Now I have to go peak at curry and comfort! 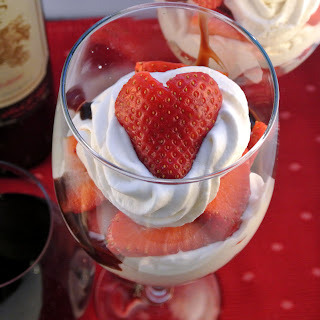 Looks gr8...this was my first thought of dessert for my valentine dinner...I mentioned that to Ramona @ Curry and Comfort too!! :-) It must have tasted awesome right?